Vice President Director of PT Toyota Motor Manufacturing Indonesia (TMMIN) Warih Andang Tjahjono said, the automotive industry requires a skilled workforce who have a certificate. By doing so, the automotive industry in the country could grow stronger. "Now we are discussing with Kadin Indonesia, Coordinating Ministry of Economic Affairs, and the Ministry of Labor that industry has a role to build a skilled workforce," said Warih, in Jakarta, Monday (9/5). Warih pointed out, the growth of skilled labor in the Philippines has been quite rapid because it is supported by a qualified certification. According to him, one of the weaknesses of labor in Indonesia, namely the difficulty to follow a certification making it less competitive. Meanwhile, in other countries are required to have certification. "This challenge, namely how to be able to certify the Indonesian skilled workforce," said Warih. Warih explained, other challenges faced by Indonesia which is related to the automotive industry supply chain. 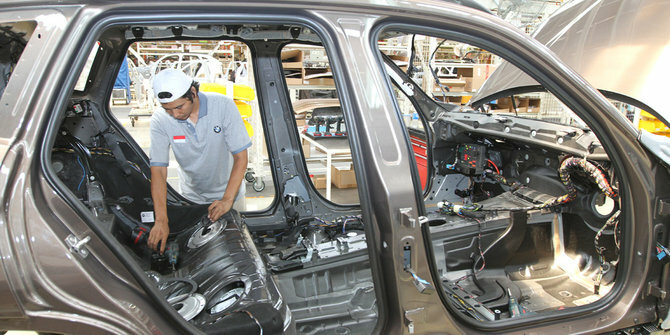 Currently, Indonesia's automotive industry supply chain is still about a thousand units, while Thailand has reached 2,000 units. Warih added, the existence of bonded logistics center is the first step to strengthen the national automotive industry supply chain as it can help smooth industrial activity. According Warih, in the future, the challenges of the automotive industry will become bigger and to be able to fill the export market needed a strong local industry. Therefore, export competition is seen not only from the country but also models of vehicles are excluded. "Filling in overseas markets baseball can be arbitrary. We have to be competitive and have a competitive edge. In addition, the industry must also be good," said Warih.